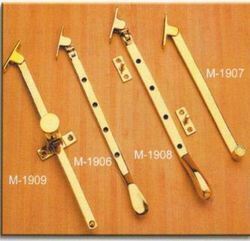 Manish International is your one-stop woodworker’s store for all of your woodworker's supplies. Shop for everything you need to start and finish your woodworking projects. 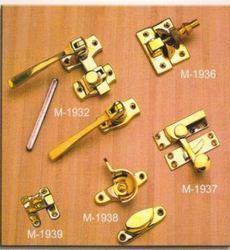 Find a huge selection of hardware products including drawer slides, door hardware & accessories. 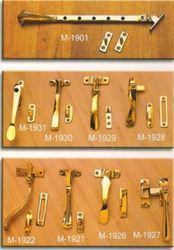 M1921 - GEO CASEMENT FASTENER WEDGE - 4½"
M1922 - GEO CASEMENT PLATE HOOK FASTENER - 5"
M1926 - VIC CASEMENT FASTENER WEDGE - 4"
M1927 - OCTAGONAL CASEMENT FASTENER - 4½"
M1928 - REVERSIBLE HOOK & MORTICE FASTENER - 3½"
M1929 - CASEMENT FASTENER WEDGE - 4½"
M1930 - KNIGHT VENT FASTENER - 4½"
M1931 - CASEMENT FASTENER LOCKING - 5"
M1932 - FRERICH WINDOW FASTENER - 4"
M1936 - BRIGHTON FASTENER - 2¾"
M1937 - SASH FASTENER - 2½"
M1938 - FISH FASTENER - 2"
M1939 - SHOWCASE FASTENER - 1"
M1901 - GEO CASEMENT STAY - 12"
M1906 - VIC CASEMENT STAY -10"
M1907 - ARMED ROLL CASEMENT STAY -8"
M1908 - OCTOGANAL CASEMENT STAY -10"
M1909 - TELESCOPIC STAY - 10"